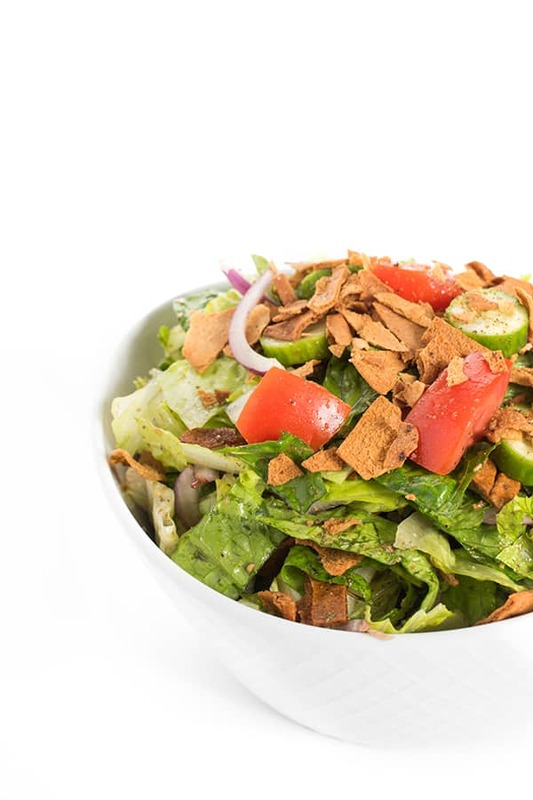 Fattoush is a Middle Eastern salad made with toasted pita bread. Mine is given a flavor boost by using za’atar to season the pita chips. 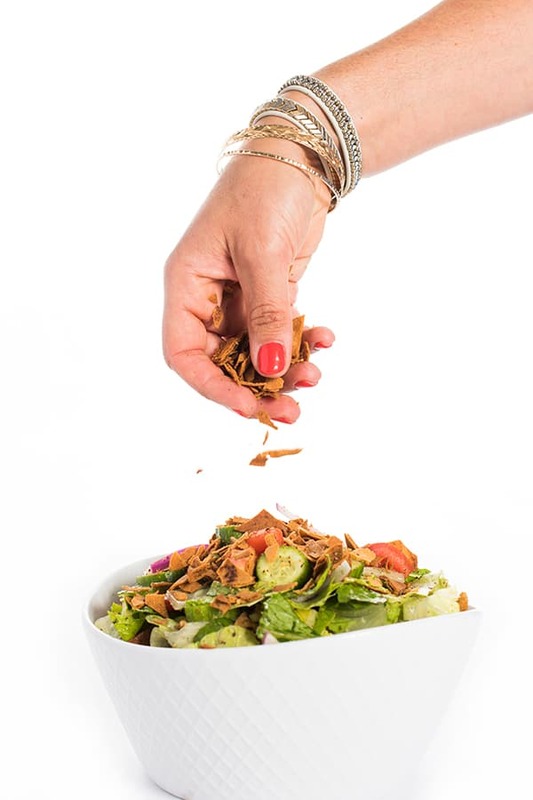 Fattoush is a Middle Eastern salad made with toasted, fried or day-old pita bread. Similar to the Italian panzanella salad, it is a great use for stale or leftover bread. Lebanese restaurants typically deep fry the pita chips. 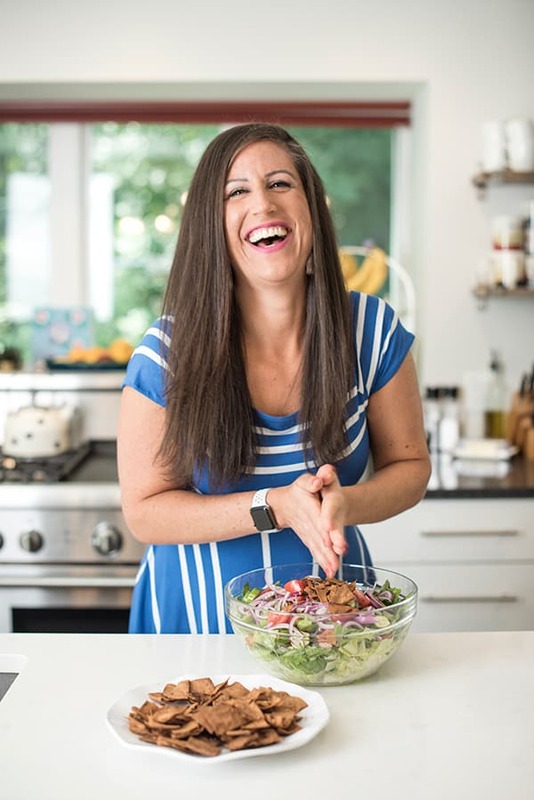 Not only does that add a ton of unnecessary fat and calories but it also weighs down the bright and delicious flavors of this classic salad. 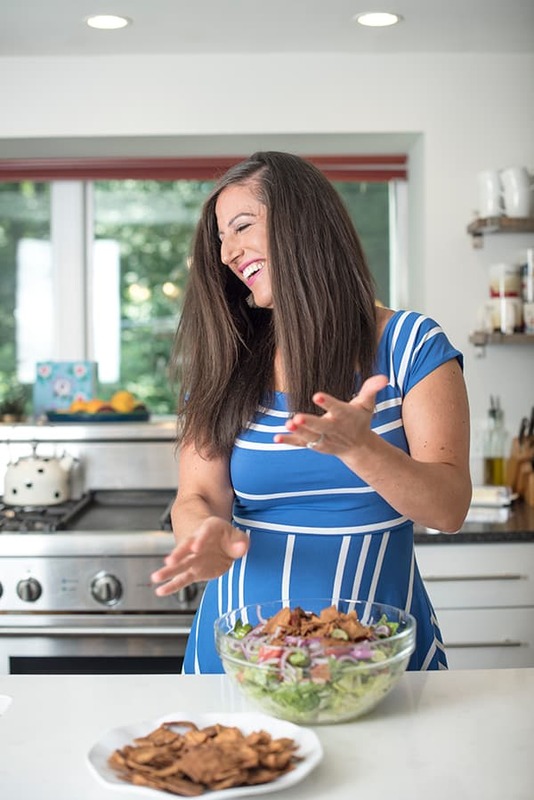 Baked pita chips are not only extremely easy but it also provides an opportunity to season the bread with za’atar, one of my favorite Middle Eastern spice blends. Each brand has a slightly different recipe but it is a combination of oregano, toasted sesame, sumac and other spices. Need more ideas for za’atar to justify the purchase? 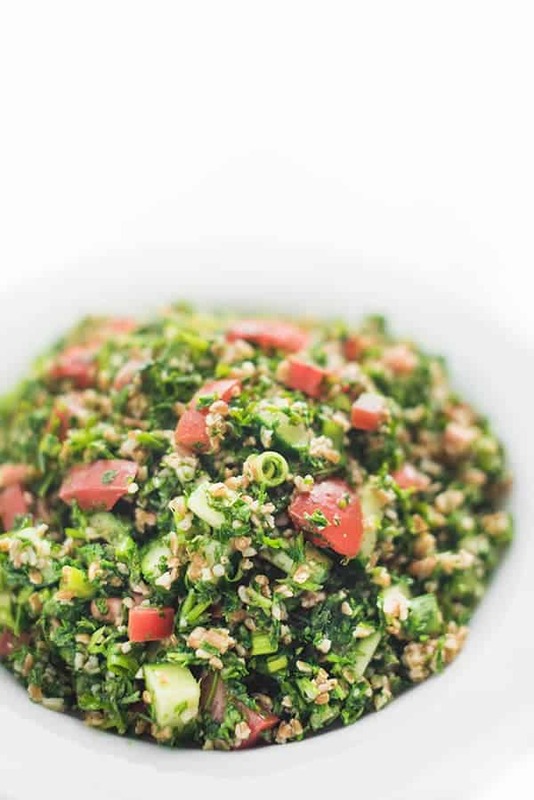 Don’t miss my Couscous Salad with Za’atar Vinaigrette or my Asparagus with Lemon and Za’atar. 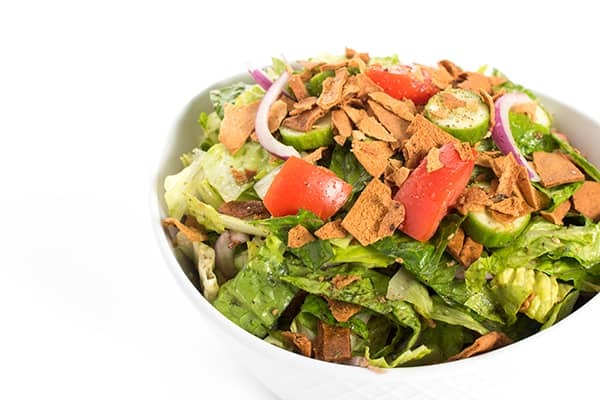 Fattoush is a Middle Eastern salad made with toasted pita bread. Mine is given a flavor boost by using za'atar to season the pita chips. 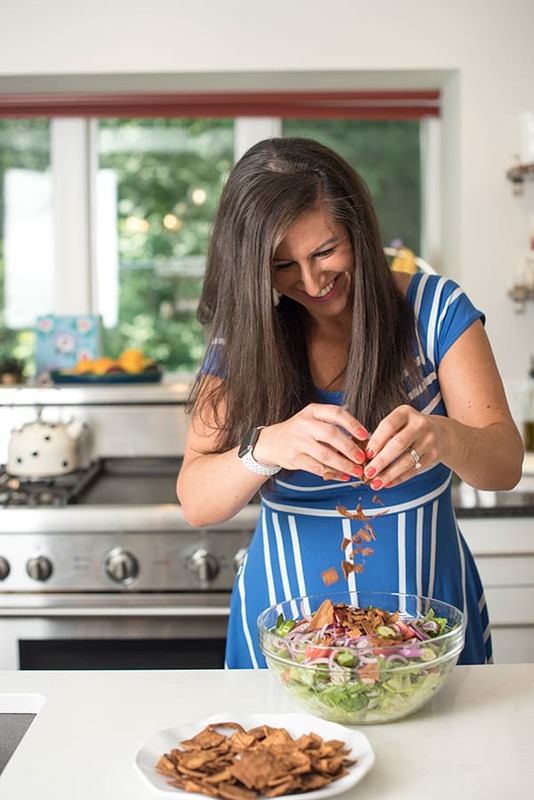 1 Middle Eastern Salad prepared as instructed - check out video! Line baking sheet with foil and spray with non-stick spray. In a large bowl or plastic bag, evenly coat pita pieces with olive oil, za'atar and salt. Spread pita in even layer on baking sheet and bake for 10-12 minutes or until nicely browned. Please Note: Very important that the pita is spread in an even layer to allow them to become crispy. Use two pans or bake in rounds if necessary. Are you looking for more delicious and easy salad dishes?? Head over to my Pinterest Board for more! I have not yet make the fatyoush Leanese Salad, but I know it’s going to ho well,with my family this Thanksgiving day, Please keep me post on all of your Leanese dishes, Thank You. Fattoush is not a Lebanese recipe but it is Syrian and mainly from Damascus . Yum!!! Love fattoush salad!!!! Gotta get some fresh Mint and lemon in there ! I’m Syrian Sephardic Jew we eat this all the time ! So yummy! Zaatar is my life ! This salad looks great! I wonder….is it the za’atar that makes it especially authentic? Actually the za’atar is my own spin! The only thing you need is pita bread which you could toast dry! Does that answer your question? Let me know if you give it a try! Thank you my dear!! It’s one of our favs! Looks perfect–can’t wait to make it. I have never had Fattoush, but I think it is definitely time to change that! It’s definitely time to change that!! So easy. Let me know what you think! Yum! This looks so delicious. I love fattoush salad. I’ve made my own with just the sumac (my husband charmed someone at a Middle Eastern restaurant into giving us some) but never with the za’atr blend. I will definitely have to find some! Smart husband!! Za’atar has sumac in it plus toasted sesame seeds which are my favorite!! Let me know what you think!